Farrar, Straus and Giroux, 9780374286002, 512pp. "War! . . . . / What is it good for? / Absolutely nothing," says the famous song—but archaeology, history, and biology show that war in fact has been good for something. Surprising as it sounds, war has made humanity safer and richer. In War! 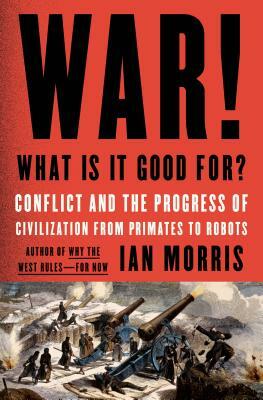 What Is It Good For?, the renowned historian and archaeologist Ian Morris tells the gruesome, gripping story of fifteen thousand years of war, going beyond the battles and brutality to reveal what war has really done to and for the world. Stone Age people lived in small, feuding societies and stood a one-in-ten or even one-in-five chance of dying violently. In the twentieth century, by contrast—despite two world wars, Hiroshima, and the Holocaust—fewer than one person in a hundred died violently. The explanation: War, and war alone, has created bigger, more complex societies, ruled by governments that have stamped out internal violence. Strangely enough, killing has made the world safer, and the safety it has produced has allowed people to make the world richer too. War has been history's greatest paradox, but this searching study of fifteen thousand years of violence suggests that the next half century is going to be the most dangerous of all time. If we can survive it, the age-old dream of ending war may yet come to pass. But, Morris argues, only if we understand what war has been good for can we know where it will take us next. Ian Morris is Willard Professor of Classics and History at Stanford University. He has published books including Why the West Rules--for Now and The Dynamics of Ancient Empires, and has directed excavations in Greece and Italy. He lives in the Santa Cruz Mountains in California.